I recently purchased an 08 LMM with 140k ( my first diesel). Drives great. Took my toy hauler out and got the change fuel filter warning and instantly went into limp mode. After changing the filter and the sensor I rebuilt the fuel filter housing. It doesn't go into limp mode but once I get on the gas it says change fuel filter still. Goes from 100 to 0. The fuel lines to the filter look crack. Replacing those next. Could the fuel lines really be causing that warning? Also are lift pumps worth the investment? If you are referencing to the rubber ones underneath the truck going up then, Yes. They will cave in on them selves and collapse with high draw of fuel. Last edited by mkayler; 04-02-2019 at 02:17 PM. I can see cracking on the hoses to the fuel filter. I am hoping that's my issue. Driving to and from work there's no problem only when I get the rpms up around 2500 it says change fuel filter. If I add a Lift pump can I leave the OEM filter? ( I dont want to delete it ) Also will the lift pump filters, How often do you change those? One possible solution is to replace your fuel filter head with a new OEM filter head. I know you rebuilt yours, but that sometimes doesn't work well enough. New filter head with new filter is in the range of $135 (or less). Not a difficult job. 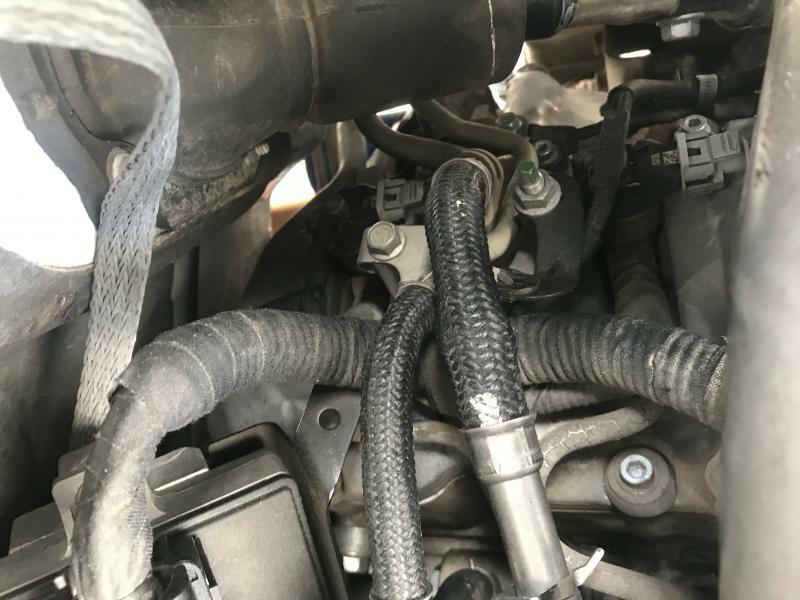 Of course there could be other causes, other leaks (suction, not pressure) anywhere in the fuel line from inside the tank to the fuel filter head. Does your problem seem to be more prevalent with a low fuel level in your tank, or high fuel level, or doesn't make a difference? I have not noticed the level in tank being constant with the issue. Just when I need more fuel it says change fuel filter? I will def look into replacing that. Just found this. The hose is kinked and a little soft. Added a hose clamp to straighten it out. Could this be the issue? Today 08:14 PM by Hook'em_Horns! Today 08:05 PM by Hook'em_Horns!